This afternoon's showdown at the HarborCenter between the hometown Buffalo Beauts and visiting Boston Pride held major NWHL playoff implications. The Beauts’ 4-1 win gives both teams matching 8-4 records, with Buffalo taking over second place as a result of winning the season series over the Pride. Dani Cameranesi led the way with three points on a goal and two assists, while Maddie Elia scored twice to take over the league lead with 11 goals on the season. The Beauts got onto the board first with 9:44 remaining in the opening period. As Buffalo forward Taylor Accursi worked the puck out from behind the Boston net, she fed a pass out to the left of the Boston net. 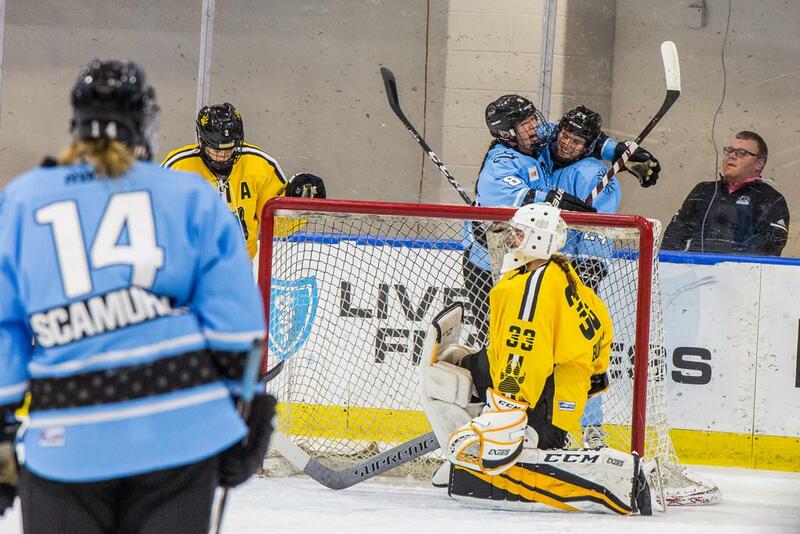 Beauts center Annika Zalewski pounced on it and fired it through the legs of Pride goalie Katie Burt. It was Zalewski's second goal of the season. Accursi received the lone assist on the tally. "The first goal was huge," said Zalewski. "I think in any game you want to put the first one in, and just grab that momentum early. That was big for us to get the first goal and go from there." Elia pushed the lead to 2-0 in the second period. As linemate Cameranesi carried the puck in on the Boston net, Burt was able to steer her shot aside. However, a rebound came out immediately. Elia, who was following up on the play popped it in a net that was mostly open. The score came at 4:11, and it was Elia's 10th of the season. At the 5:45 mark of the second frame, Buffalo made it 3-0. Cameranesi and Kelly Babstock broke in on a 2-on-1 break against Boston defender Lexi Bender. Appearing as if she may pass across to Babstock, Cameranesi instead fired a hard shot that went right by Burt. The goal - Cameranesi's fourth of the season - was unassisted. The Pride got on the board a short time later when Jillian Dempsey scored to make the score 3-1. The Pride swarmed in on the Buffalo net and while the Beauts seemed to be focused on McKenna Brand, Dempsey was mostly unguarded and fired a shot on a pass from Brand. The puck eluded Beauts goalie Shannon Szabados and ended up in the back of the net. Defender Lauren Kelly and forward Denisa Krizova picked up the assists on the goal for the Pride. Elia put the icing on the cake for Buffalo late in the third period. Hayley Scamurra fed a pass out front from behind the net. Elia one-timed it and beat Burt up high for her 11th goal with only 53.6 seconds remaining in regulation. Scamurra earned the primary assist, with Cameranesi getting her third point of the day with the secondary helper. Buffalo outshot the Pride 46-22, and that ultimately was the difference maker. "I think our whole team was in the zone tonight," said Cameranesi. "We had a lot of puck movement and I think that was key for us in the offensive zone. Taking care of defense first is kind of where we started, and that gave us the ability to play on offense and have those opportunities." The Beauts hit the road to take on the Metropolitan Riveters on Feb. 2 at RWJBarnabas Health Hockey House, while the Pride return home to host the Connecticut Whale the same night at 7:30 PM at Warrior Ice Arena. Tickets are available at NWHL.zone/tickets.